My humor writing has also been published on the Erma Bombeck Writers’ Workshop site at humorwriters.org. –> La! La! La! I can’t hear you! Oh–and you may have also seen me before in a few movies. Yeah, I’m sorta famous. But not really. Check out: My Secret Movie Star Life. So are you gonna share or what? Jeezum crow! All the good bloggers are Mainers (or should I say Mainah’?). I *swear* this is true: Yesterday afternoon I started thinking about starting to seriously study writing for real in the new year. Maybe I would take a workshop. Or maybe I’d just start reading only humor essays…and all I could think of were male names (Dave Barry, Gene Weingarten. . .). I challenged myself to come up with well-known female humor writers and Erma Bombeck’s name was all I could think of! I hadn’t thought of Erma Bombeck in years or of taking a writing workshop ever. You and Erma just blew my mind! Congratulations on this well-deserved recognition! That is too freaky! I would take that as a serious sign from the universe you should send a submission to Erma’s site. They are very receptive and looking for new posts all the time. I think I was just “vibin'” on the good fortune of a very talented blog buddy. I never know when one of my random thought trajectories is going to turn out to be something. It always surprises me when it does, though! I mean no disrespect, but how random a thought is Erma Bombeck for the middle of a busy workday? Yeesh! Hi, my name’s Darla Jo. I like plaid and ugly tortoise shell glasses. Welcome to my blog! Looking for something? Good Luck! 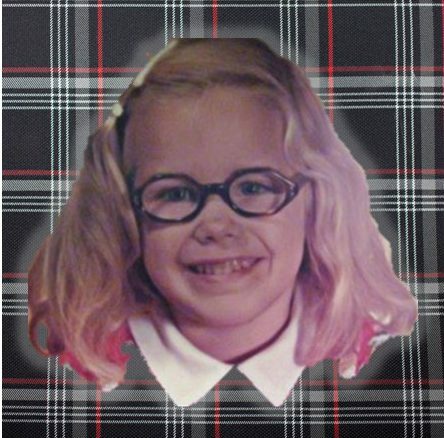 This message brought to you by Atrociously Ugly Plaid Collars and Sad Buck Teeth Unlimited. Thanks for reading my blog. Love, 5-year-old me.